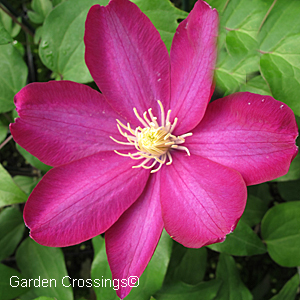 (Clematis) Bourbon™ Clematis is an exciting new compact clematis from Raymond J. Evison. Evison specifically hybridized this prized variety for patio containers. The compact growth reaches only 3-4 feet tall, which makes it a perfect fit for large patio pots. Bourbon™ is equally happy though when grown in the ground and allowed to scramble up a small trellis. The large 6 inch flowers are red with bright purple bars in the center of each petal. Flowers rebloom throughout the summer for an incredible display!